How much drying space do you really need? That’s the question you’ll be asking when it’s time to upgrade your old dryer. 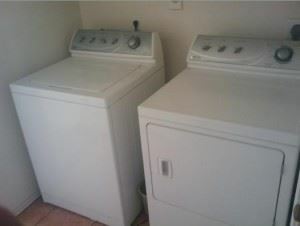 Basic dryers come in a range between 25″ to 29″ as regular, wide or oversized. The big boys have 7 cubic feet drums all the way down to the mini 3 cubic feet. It might come down to the questions of where will you put your dryer and how big is your family? If you’ve got a large brood and the space you’re better off going for the bigger drum. Another thing to look out for is a dryer with a moisture or dryness sensor. When activated, these sensors let the dryer know when your clothes are actually dry. It will then automatically shut off even if you have several minutes left in the cycle. This is going to cut back on your energy bills by a huge amount. Temperature controls are also important to help safeguard your fabrics. Low of fluffy drying cycles should be used for delicates while a high dry is perfect for everything else. How quiet do you want your dryer? If it’s next to a bedroom or the TV room it could cause problems. Ask about the noise factor and see if you can get an in store demonstration of the model. The price of DVD and Blu Ray players are so cheap that it almost doesn’t make sense to get an extended warranty. However, you’ll be using your dryer a lot longer. That’s why it’s best to pay the extra for those warranties as long as parts and in home visits are covered. When you’re ready to make the switch, you need to think about how you’re going to get rid of your old model. Not every delivery company offers a take away service. That’s why you’ve probably seen a lot of washing machines and dryers taking up space on people’s porches or in their garages. A terrific option for old washing machine and dryer disposal is hiring Junk King Raleigh. You’ve probably seen one of their trucks making the rounds in Raleigh because the JK crews are extremely busy. They’re helping all kinds of folks get rid of all kinds of junk. Look at it this way; if you got something in your home that took a delivery truck to bring in then you’re clearly going to need that kind of truck to get rid of it. That’s just what you’ll be getting with Junk King Raleigh along with a dependable crew of hard workers and heavy lifters. You worry about picking out the right new machine and let Junk King handle the old machine. This entry was posted in Junk King Raleigh, Junk Removal Prices, Raleigh Appliance Disposal, Raleigh Junk Hauling, Raleigh Junk Removal, Washer Dryer Disposal and tagged Dryer Disposal, Raleigh Washer Dryer Disposal, Washing Machine Removal on March 29, 2013 by Britt Holcomb. Last updated August 1, 2017 .